You're invited! 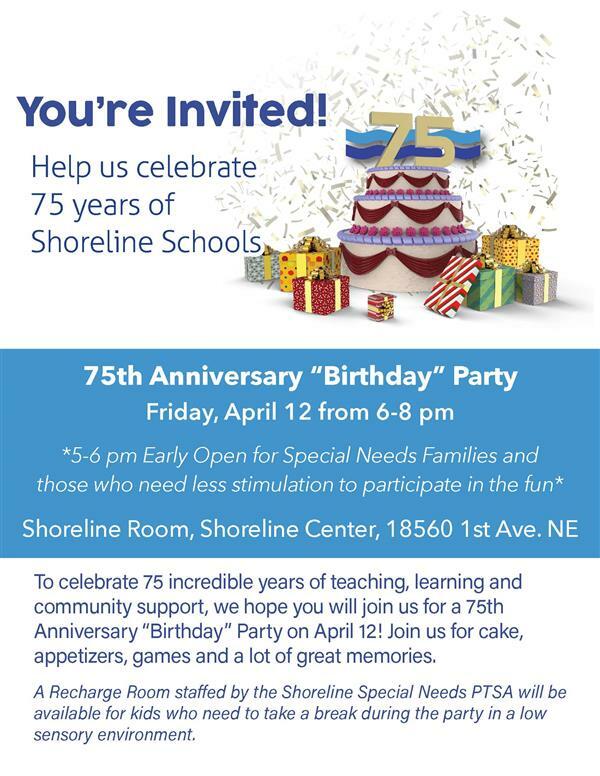 Help celebrate the 75th Anniversary of Shoreline Public Schools on Friday, April 12 from 6-8 pm in the Shoreline Room (north end) of the Shoreline Center, 18560 1st Ave. NE. The birthday party themed event is free and perfect for all ages! Guests will enjoy party games, prizes, appetizers, desserts and a lot of great memories. A Recharge Room staffed by the Shoreline Special Needs PTSA will be available for kids who need to take a break during the party in a low sensory environment. There is no need to RSVP but if you have questions, contact Curtis Campbell at 206-393-4412.